Preheat your grill to where it will sear the meat as soon as it hits the grate. I hope you aren’t one of those people who must clean your grill each and every time. Leave it seasoned! If you do so, the tuna fillet won’t stick to the grate. Take a large bowl and squeeze the lime to get all of the juice out. If you are having trouble, use a fork on the inside and twist. Add in a half tablespoon of sea salt. Don’t add any more than that right now. Dissolve the salt in the lime juice as best you can. Appetizer prep: Take one fillet and slice off between six and 10 half-inch cuts (or more depending on how many you have over). Lay them in the lime juice; by the time you get to the other end, you can flip them from start to finish. Take them out and lay them on a small plate. Don’t add any more seasoning to these. Main dish prep: Place a fillet in the bowl for about 30 seconds per side. You really don’t need more than that. Flip, repeat and then take it out and place them on a plate (repeat if you have more than one fillet). When you have all fillets on a plate, sprinkle with sea salt and black pepper over the top of half of them, flip, and repeat. For the others, cover them with the seasoning, flip and repeat. 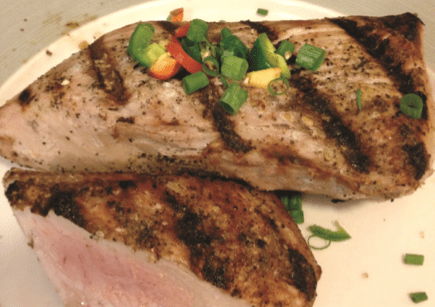 Appetizer: Use the top rack of the grill and lay down each slice of tuna. Close the grill for 30 seconds, open and flip them over. Close the grill again, and 30 seconds later you have tasty tuna apps. I ate mine right off the grill – they were so good! Main dish: Lay the remaining fillets on the grill, with the heat still medium-high. Let them sear on one side for 20 seconds and then turn the heat down. My fillets were super thick, so I left them on one side for six minutes. Flip them and leave them for another five or six minutes. If they are thinner steaks, reduce the grill time. Overcooking will certainly dry them out! While the tuna is being grilled to perfection, chop up the scallions and jalapeno. Mix them together – these will garnish the top of the steak. Add a drizzle of soy sauce on the plate, if you like that flavor. I like my tuna medium-rare, and that is precisely how they should come out. Garnish with the scallions and jalapeno, serve with some salad, or maybe a side of fruit, and dig in!